Millbrook is a village in Dutchess County, New York, United States. Millbrook is located in the Hudson Valley, on the east side of the Hudson River, 90 miles (140 km) north of New York City. Millbrook is near the center of the Town of Washington. As of the 2010 Census, Millbrook's population was 1,452. 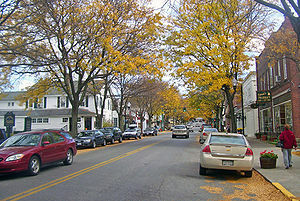 It is often referred to as a low-key version of the Hamptons and is one of the most affluent villages in New York. According to the United States Census Bureau, the village has a total area of 1.901 square miles (4.92 km2), of which 1.9 square miles (4.9 km2) is land and 0.1 square miles (0.26 km2) (2.60%) is water. As of the census of 2000, there were 1,429 people, 678 households, and 361 families residing in the village. The population density was 764.3 people per square mile (295.0/km²). There were 744 housing units at an average density of 397.90 per square mile (153.6/km²). The racial makeup of the village was 95.90% White, 2.70% African American, 0.20% Asian, 0.30% from other races, and 1.00% from two or more races. Hispanic or Latino of any race were 3.00% of the population. There were 678 households out of which 23.7% had children under the age of 18 living with them, 42.6% were married couples living together, 8.3% had a female householder with no husband present, and 46.8% were non-families. 40.9% of all households were made up of individuals and 19.0% had someone living alone who was 65 years of age or older. The average household size was 2.10 and the average family size was 2.88. In the village, the population was spread out with 21.0% under the age of 18, 5.9% from 18 to 24, 25.3% from 25 to 44, 26.7% from 45 to 64, and 21.1% who were 65 years of age or older. The median age was 44 years. For every 100 females, there were 85.1 males. For every 100 females age 18 and over, there were 82.4 males. The median income for a household in the village was $68,552, and the median income for a family was $96,473. Males had a median income of $67,917 versus $57,400 for females. The per capita income for the village was $49,114. About 1.0% of families and 5.7% of the population were below the poverty line, including 4.4% of those under age 18 and 1.9% of those age 65 or over. Millbrook is the site of the Hitchcock Estate, which Timothy Leary made a nexus of the psychedelic movement in the 1960s and where he conducted research and wrote "The Psychedelic Experience". Millbrook was also the location of the campus of the former Bennett College, which closed in 1978. Millbrook is served by Dutchess County Public Transit's route "D" bus. Timothy Leary, Harvard psychologist involved in the "psychedelic movement" lived with the Mellon siblings from 1963-1968. He was arrested here by G. Gordon Liddy, then an Assistant District Attorney for Dutchess County New York. Charles F. Dieterich, (1836-1927) German-born acetylene gas mogul and a founder of Union Carbide. William Mellon "Billy" Hitchcock, Tommy Hitchcock III, and Margaret Mellon "Peggy" Hitchcock, siblings and heirs to the Mellon fortune owned an estate in Millbrook . ^ "Route D Monday through Saturday Bus Schedule Poughkeepsie to Millbrook and Wassaic | Division of Public Transit". www.dutchessny.gov. Retrieved 2018-04-01. ^ Mcquiston, John T. (18 August 1988). "Franklin Roosevelt Jr., 74, Ex-Congressman, Dies". The New York Times. Retrieved 13 August 2016.